With 400,000 tonnes of food wasted in Wales each year - including a spike at Christmas - new community fridges are being used to try and cut that amount. One in Cardiff allows students and struggling families to pick out items. "Students come and take loaves of bread and freeze them," said Polly Wilson of the Community Fridge project. Another charity works with supermarkets to deliver more than 500 tonnes of surplus food to shelters and refuges in south Wales every year. The fridge is in the courtyard at Cathays Community Centre and is staffed by volunteers who log what goes in and remove items past their sell-by date. Donations come mainly from supermarkets, but also cookery shows that film in the area. "There's no one standing there judging them. You take what you want and you take what you need," said Ms Wilson. Charity FareShare, distributed 509 tonnes of surplus food across south Wales between April 2017 and April 2018. It works with major supermarkets and suppliers and gives it to people in homeless shelters, women's refuges and community groups. Sarah Germain said the charity was "doing something practical" to "give back to the community". All food comes into a large warehouse, where it is logged and stored before being distributed. 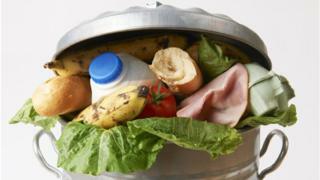 Some smaller retailers are using technology to tackle food waste. Too Good to Go is one of a number of apps that allows customers to buy unsold food from cafes and restaurants at a discounted price. Neesha Ali, manager of Dough, a Cardiff sandwich shop, said: "The sandwich fillings only have a two-day life and the pastries go stale. "It [the app] helps students a lot." Could community fridges replace food banks?